The PM-35LC-ADV is a new series of adjustable, voltage-input Digital Process Meter from DATEL. This series operates from industry standard 24Vdc (@40mA, max.) and includes a snap-in bezel that allows for quick setup and installation. It is a low cost alternative and an ideal replacement for many OEM panel meters found in industrial applications. 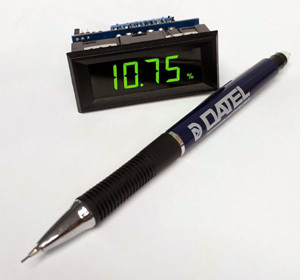 DATEL, Inc. has announced the introduction of the PM-35LC-ADV series, a new line of Digital Panel Meters with four user-selectable annunciators for displaying Volts ("V"); Amps ("A"); kilowatts ("kW"); or Power Factor ("PF"). Optional models can be configured to display degrees Celsius ("°C") or Fahrenheit ("°F"); pounds per square inch ("PSI"); or percent ("%"). Each unit features PC-board style jumpers that simplify user selection of input signal range, decimal point position and engineering unit annunciators. This series is specified to operate over the temperature range of 0 to +50°C. Samples for all models of this new series are available upon request. In addition to our standard product offerings, DATEL has the solution to your Diminishing Manufacturing Sources and Material Shortages (DMSMS) component problems. DATEL is frequently approached by our customers to help them resolve obsolescence, End-of-Life (EOL) and/or reduced access to qualified legacy products. DATEL has the design knowledge and manufacturing capability/experience/expertise to provide alternative solutions to on-going and mature defense and aerospace programs which suffer from Diminishing Supplier-Base issues.